A dog now named Pocket has a past shrouded in darkness. 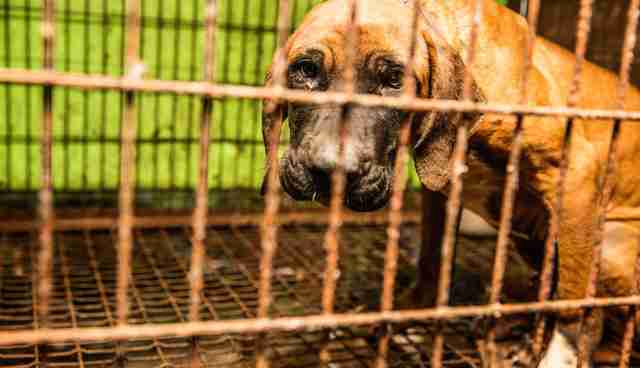 Pocket awaits rescue from a dog meat farm in Chungcheongoamdo, South Korea. Manchul Kim/AP Images for HSI. As he was recently carried from a wire cage and placed in a crate to take him to his new life, Pocket seemed petrified by the world around him - and for good reason. More than 2 million dogs are raised each year in South Korea just to be killed for their meat, and Pocket was one of them. But some people are fighting to stop this. 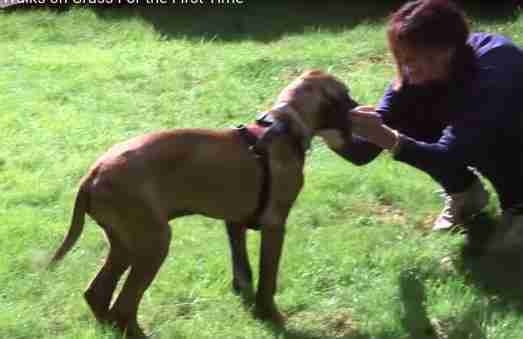 In September, Pocket was one of over 100 dogs rescued from a South Korean meat farm after Humane Society International (HSI) negotiated with the farmer and shut down his operation.YouTube/The Humane Society of the United StatesPocket and the other dogs were placed in loving homes across the U.S. In newly released footage, we see Pocket enter his bright new life, leaving the wire cages of the meat farm behind him.We watch him tremble as he's helped to a patch of grass - something he's never touched before.YouTube/The Humane Society of the United StatesPocket's fear of the world begins to melt away as he feels the ground under his paws for the first time.YouTube/The Humane Society of the United States"It's alright now, sweetheart," his rescuer says to him, "it's alright. "YouTube/The Humane Society of the United StatesSoon, standing there in the sunshine, his tail starts to wag.YouTube/The Humane Society of the United StatesHelp end the dog meat trade here. Read about Pocket's rescue here.Have a tip? Email sarahv@thedodo.com. But some people are fighting to stop this. In September, Pocket was one of over 100 dogs rescued from a South Korean meat farm after Humane Society International (HSI) negotiated with the farmer and shut down his operation. Pocket and the other dogs were placed in loving homes across the U.S. In newly released footage, we see Pocket enter his bright new life, leaving the wire cages of the meat farm behind him. We watch him tremble as he's helped to a patch of grass - something he's never touched before. Pocket's fear of the world begins to melt away as he feels the ground under his paws for the first time. "It's alright now, sweetheart," his rescuer says to him, "it's alright." Soon, standing there in the sunshine, his tail starts to wag. 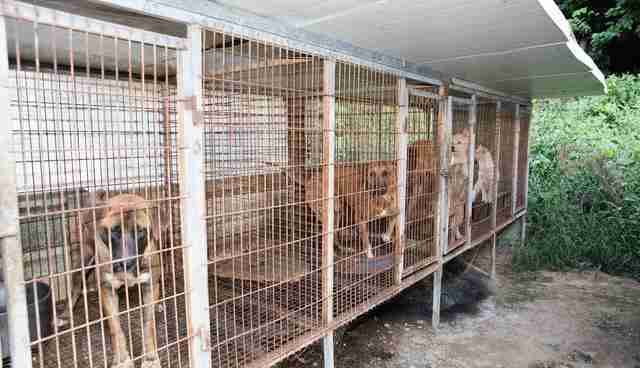 Help end the dog meat trade here. Read about Pocket's rescue here.